"Chakra” means, in a word, “wheel." Imagine spiraling energetic channels along your spine. This is easy for some, but it’s like unicorn sci-fi for others. Uncomplicate the chakras with this quick, digestible overview. If that quote didn’t click for you just yet, that’s okay. Keep reading, especially the cheat sheet toward the end, and then circle back. There are thousands of energetic channels running through your body. Of those, 7 stack up your spine, from its base to the top of your head, as your main energetic centers. Their locations correspond to the 7 main nerve ganglia emanating along your spine and the endocrine system glands in those areas. Let’s backtrack for a moment and break it down a little differently. “Chakra” means, in a word, “wheel." In more words, a chakra is a spinning vortex that receives, absorbs and distributes energies. These spinning wheels are measured as electromagnetic force fields within and around all living beings. We all have them, but not many of us have them functioning in their perfectly balanced states. Imbalanced chakras can help explain the roots of our issues. It’s kind of like a treasure map: trace the problem to the corresponding chakra, and you know what to do to help heal it. Each chakra holds specific abilities for your physical and emotional life. When a chakra is spinning too little, too much, or not at all, the abilities that it houses are thrown off. Think of a houseplant. Give it too much water and it rots. Don’t give it enough water and it shrivels. Your chakras need just the right amount of energy to function at their best. For example, if your root chakra is spinning optimally, then you feel secure about your life, grounded and independent. If its spinning is not optimal, you may feel like you’re waiting for the other shoe to drop and stuck in survival mode - both internally and with your surrounding world. How’s your posture right now? Are your shoulders rounded forward with a concave chest? That could indicate trouble with your Heart Chakra. Look at someone’s spine - how it’s aligned or misaligned - and you may be able to tell a lot about the state of their chakras, and their well-being. What do you do if your chakras are imbalanced? Well, yoga helps! 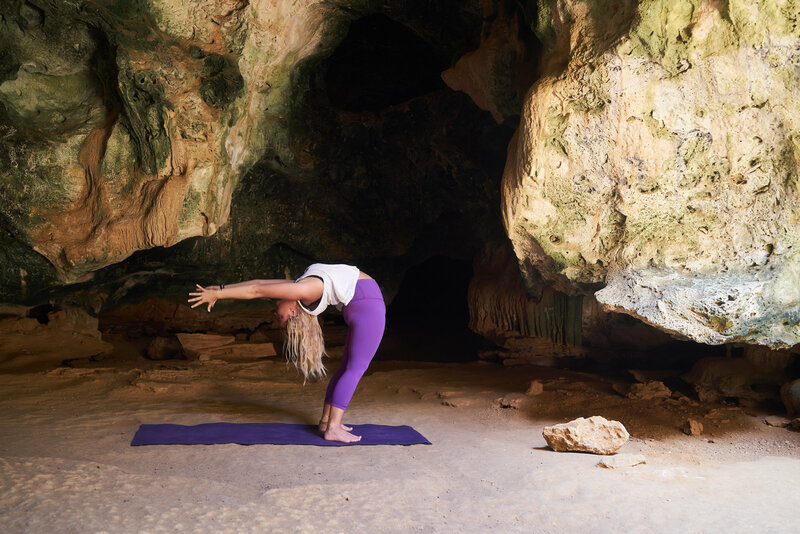 Certain poses can help unblock and strengthen certain chakras, clearing a path for you to feel balanced and attain higher consciousness and connection. Like yoga poses, there are many associations to your chakras, including certain colors, sounds and elements. Visualizing the color yellow can help boost your willpower (solar plexus chakra), for example. Yoga poses to come back to balance: Grounding into your bones and feet! Yoga poses to come back to balance: Hip openers! Yoga poses to come back to balance: Build heat! Yoga poses to come back to balance: Heart openers! Yoga poses to come back to balance: Neck stretches and shoulder openers! Yoga poses to come back to balance: Draw focus inward! Yoga poses to come back to balance: Balance and focus awareness on your body and the present moment! If your curiosity has been piqued here, we encourage you to dive deeper into studying the chakras! Check out oneOeight.com for Kimberly Snyder’s guide to eating for your chakras and Coral Brown’s yoga sequences for each chakra! From this article, can you gauge which of your own chakras are doing well and which could use some more attention and support? Share your epiphanies or action plans with our community in the comments below!